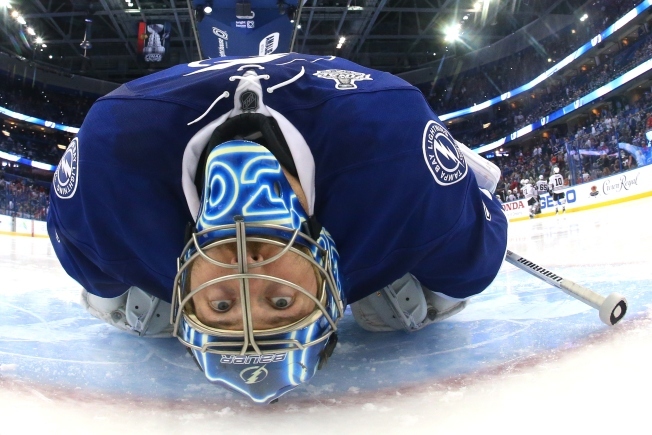 Ben Bishop (30) of the Tampa Bay Lightning stretches during a break in play in between the second period and third period against the Chicago Blackhawks in Game 1 of the 2015 NHL Stanley Cup Final at Amalie Arena in Tampa, Florida. Tampa Bay Lightning goaltender Ben Bishop didn't break out an "I'm just doing this so I won't be fined" routine, but he did reference Marshawn Lynch during his pregame media availability Monday afternoon. After nearly two months of exhausting playoff hockey, and several questions surrounding why he left his post in Game 2 of the Stanley Cup Final, it wasn’t surprising that Bishop was a bit confrontational when he was asked if he would start in Game 3. Lynch made headlines earlier this year when he repeated "I'm here so I don't get fined" for five minutes at Super Bowl XLIX Media Day. Bishop came out of the Bolts’ Game 2 win on Saturday night twice during the third period, with one stint lasting long enough for his team to score a power play goal, then came out for good a few minutes later. The team has been mum on Bishop’s condition, and even though the goaltender did practice with the team and came off of the ice first (standard procedure for the starter), there has been no confirmation that he will play. When asking Lightning head coach Jon Cooper the same question, the team’s bench boss was equally combative.